In Mahabharata the name "Krishna DvaipAyana" (Dark skinned, Island born) is used quite a lot. Yet the other usage of "Veda VyAsa" is more famous. What's the origin of this second name? Is the Punjab originated river "Beas" (Bias) which is said to be misnomer (अपभ्रंश) of VyAsa was indeed created by this Rishi? Answering only your one Question Why is sage Krishna DvaipAyana known as Veda VyAsa? During every Dwapar Yuga of the present Vaivasvat Manvantara, different Vyasas have divided the Vedas twenty-eight times. 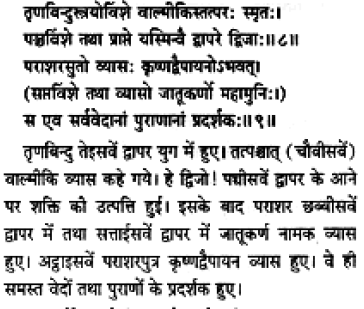 During the first Dwapar, Brahma himself had divided the Vedas. During the second Dwapar, Prajapati was Veda Vyasa. During the third Dwapar, Shukracharya was Veda Vyasa, During fourth Dwapar, Brihaspati acted as Veda Vyasa. Description of other sages who acted as Veda Vyasa during the subsequent Dwapars is as follows- Surya- fifth Veda Vyasa; Mrityu- sixth Veda Vyasa, Indra- seventh Veda Vyasa, Vashishta- eighth Veda Vyasa, Saraswat- ninth Veda Vyasa, Tridhama- tenth Veda Vyasa, Trishikh- eleventh Veda Vyasa, Bharadwaj- twelfth Veda Vyasa, Antariksh- thirteenth Veda Vyasa, Varani- fourteenth Veda Vyasa. Names of next fourteen Veda Vyasas are as follows- Trayyarun, Dhananjay, Krutunjay, Jay, Bharadwaj, Gautam, Haryatma, Vajshrava, Trinbindhu, Riksh (Valmiki), Shakti, Parashar, Jatukarn and Krishnadwaipayan. After Krishnadwaipayan, Drona's son, Ashwatthama will be the next Veda Vyasa. Devi Puraana explains why Krishna Dvaipayana is called Veda Vyaasa. Seeing the advent of KaliYuga, He divided the Vedas into various Branches. As he expanded the Vedas, the Muni got his name as Vyaasa. Not the answer you're looking for? Browse other questions tagged mahabharata culture identification-request name vyasa .